There is nothing Dirt Wheels loves more than a letter or an e-mail with a radical, high-quality photo included. Some relevant info is just a gilded frame on the shot. And then there are exceptional days like when we hear from photographer Stephen Tripp. We heard from Stephen out of the blue after the 2018 Daytona SX quad race. He was wondering if we wanted to use any of his photos from the event. His shots were amazing, and we aren’t stupid, so we used them. 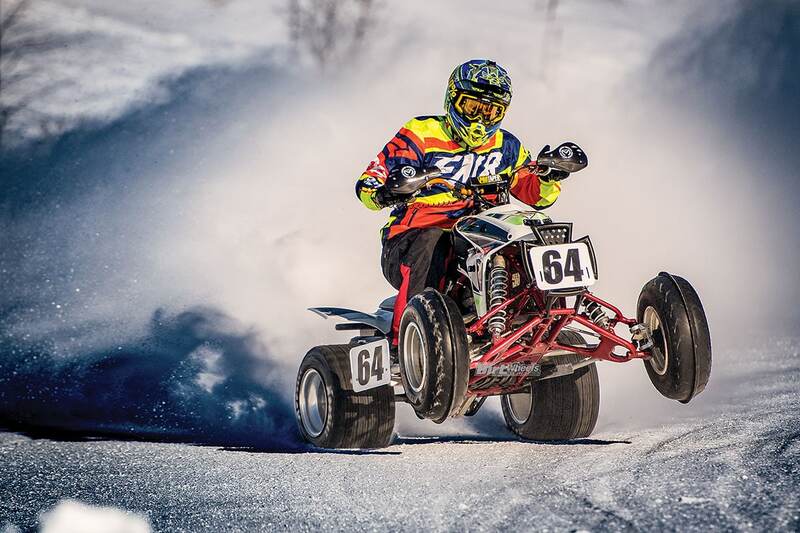 Josh Underwood (52) was the Great Lakes Ice Racing Club’s 2017 Non-Studded Open-class quad champion. He provided the information for this story, and it looks like he knows what he is doing. WHAT DO YOU MEAN “NO SCREWS OR STUDS”? Having snow on the track affects the machine’s setup. 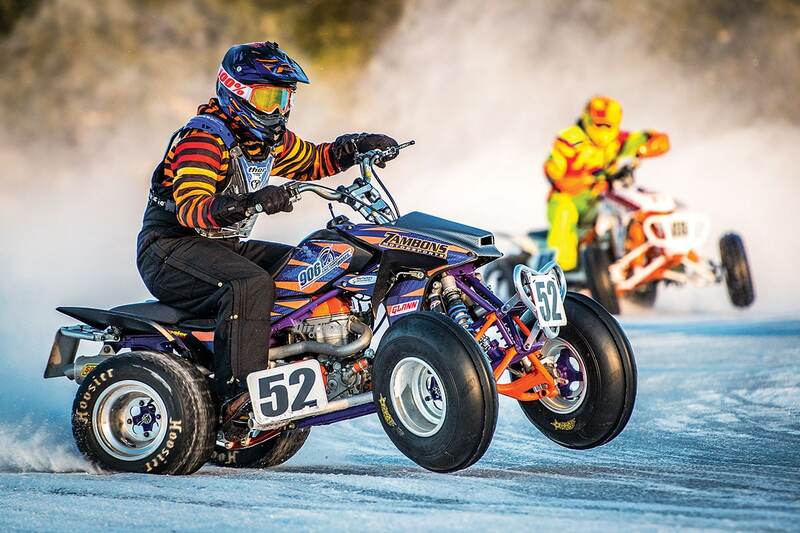 Jeff Schrick from Oregon Coast Powersports came out and ran some races, and now he is hooked. There’s not much ice in Oregon. Take it away, Josh: “Every club has its own rule book, unless they strictly use AMA rules, but that is rare. Some clubs break them down by machine specs and others by rider experience/talent. 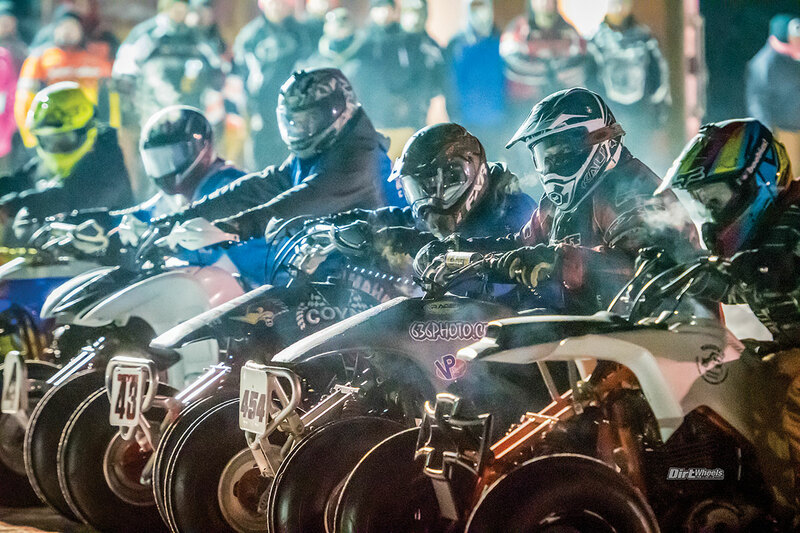 The class rules tend to overlap, though, and the desire to bring in traveling competitors usually allows for some leniency to non-club members. “The Non-Stud classes remove the front brakes for multiple reasons: weight reduction, less rolling resistance, and to avoid accidentally pulling the front brake lever and upsetting the quad. 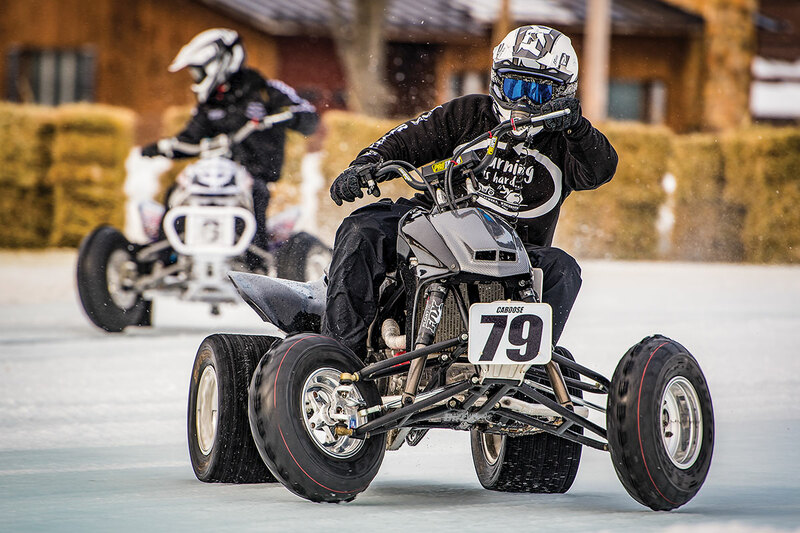 Many of the clubs have classes for UTVs and motorcycles, in addition to quads. Some even allow passenger cars to have their own classes. “There are usually quite a few different classes of studded and non-studded quads. Many things come into play with suspension and tire setup. Things like temperature, ice density, amount of snow, texture of the ice surface and many more make or break your setup. To make things more difficult, the ice changes every lap. The classes look full and pretty serious. Some of the better winter helmets have battery-heated face shields. Apparently, these are common classes. The classes for Non-Studded are: 0 to 300cc Air-Cooled, 0 to 400cc Air-Cooled/250cc Liquid-Cooled Hybrids and the Open class. Non-studded tires look like TT/dirt track tires, but the surface is radically cut to get many biting edges. The Studded classes are Sportsman and Open. 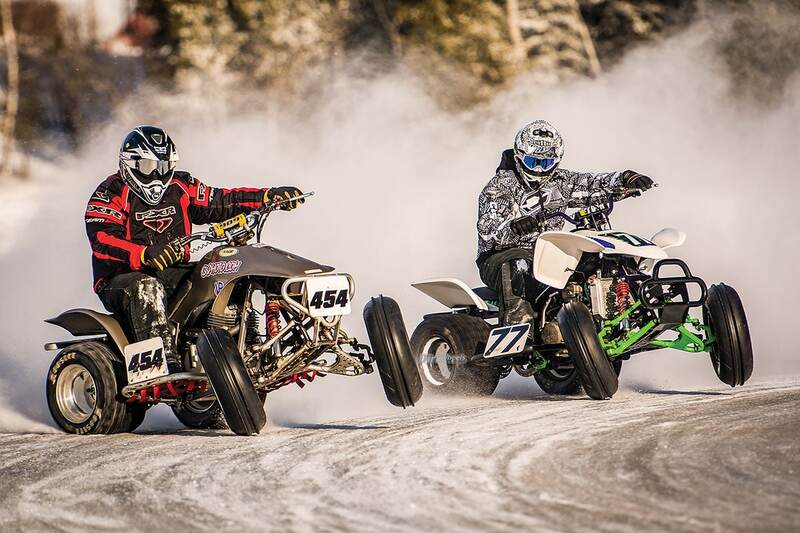 The Sportsman class is for less experienced riders. 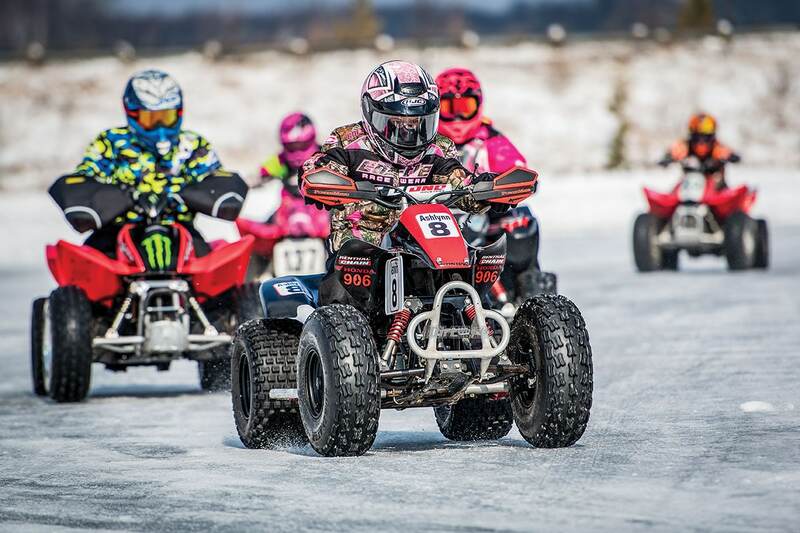 Most races take place on frozen lakes and rivers, but some races take place on flooded dirt tracks. Riders stage and get ready to race. Some of the tire-cutting patterns on these machines are amazing. It looks like they really hook up. We looked the photos over carefully, and what we saw looks like a great time. There seemed to be plenty of youth machines and many female racers. Some racers look super serious, while others are obviously motivated by the fun factor. We aren’t sure who Ashlynn is, but she has a pretty serious race face leading one of the Small-Bore classes. 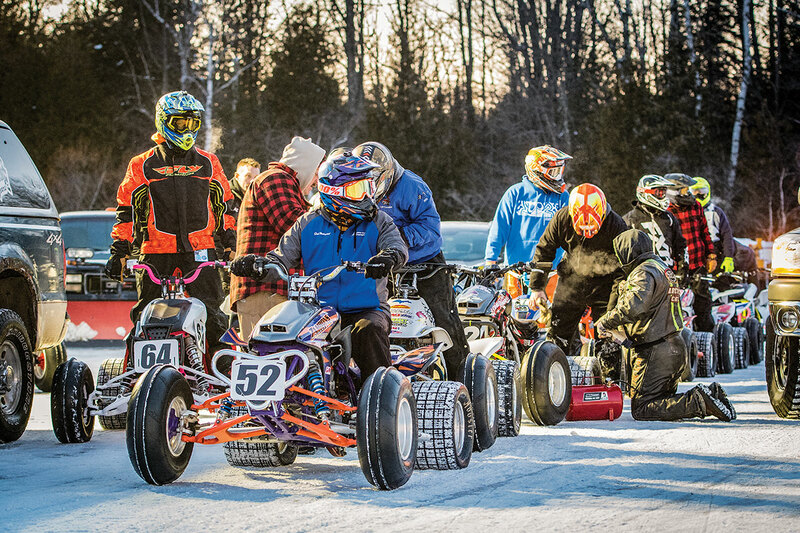 Check with shops in your area and do internet searches for ice races if you are interested in finding an ice racing venue near you.